Depending on the conditions we'll aim to get you up and riding small green waves and turning the surfboard so you can start riding down the line. We'll teach you how to choose the best waves to maximise your time in the water, explain surf lingo, and help choose the right board for your level. Your surf experience is important to us which is why we don't use a one-size-fits-all approach. Choose the Surf Package and we'll tailor classes to your level of experience. 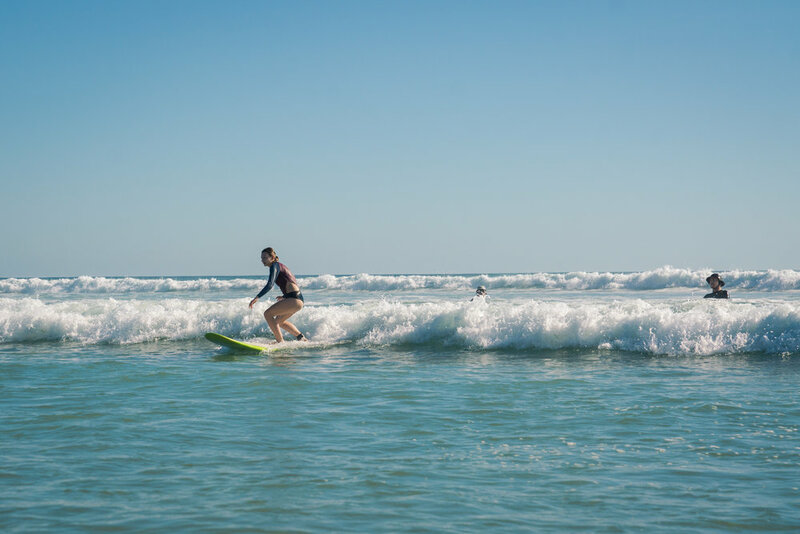 If you're a complete beginner and looking to learn how to stand on a surfboard for the first time, our experienced surf coaches will provide you with the building blocks to achieve your goal. If you're an intermediate or advanced surfer and have progressed to surfing green waves ‘out the back’ we'll help you fine-tune your skills. For complete beginners, our goal is to give you all the essentials to kick-start your surfing career; from the mechanics of standing up on a surfboard and riding waves to board-handling techniques, water safety, and understanding tides, wave formation, and ocean currents. We'll ensure that you have the right combination of 'pop-up' practice on the beach to increase 'muscle memory', and repetition and drills in the water for ongoing skill development. Most importantly, we keep our student-to-coach ratio low to ensure that you don't get 'lost in the crowd'. We're not a big surf camp, preferring to focus on quality not quantity. At the most, you'll be with just 2 other students with our maximum 3:1 coaching ratio.In addition, we don't mix beginners with advanced students so you won't feel like things are going too quickly (or too slowly!) for your level. 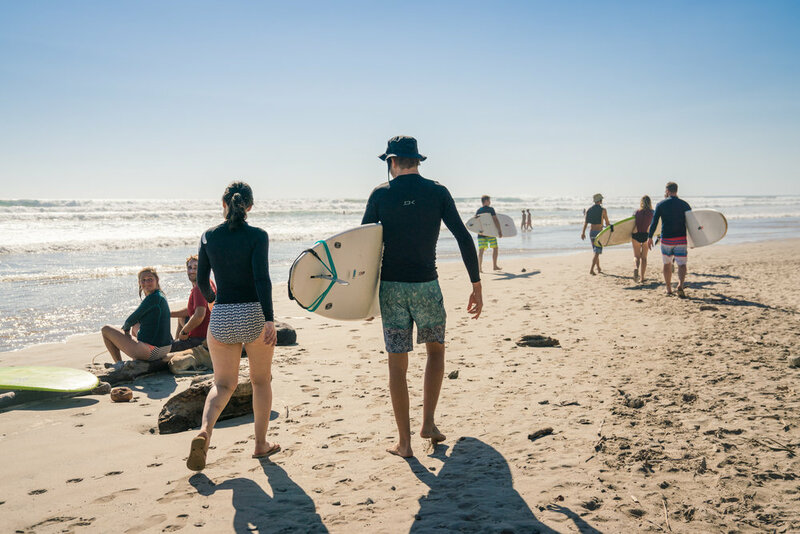 For intermediate surfers - whether your experience is of a few weeks of surf classes or you've been riding green waves for some years – we'll help you take your surfing to the next level. We'll ensure that you leave Shaka with more knowledge and experience than when you arrived including assisting you to improve your ability to 'read' waves and perfect the timing of your take off down the face of a wave. If surfing is not your passion choose our Chill Package to enjoy all the other benefits of Shaka, including daily yoga classes in our private jungle yoga studio.